Sri Lanka Air Force (SLAF) bombers hit civilian settlements three times in Murasumoaddai in Vanni killing civilians and causing injuries to many on Thursday. At least 5 civilians have been reported dead so far by the medical staff at Tharmpuram hospital. 28 civilians, including five children, were admitted at the hospital after the attacks. 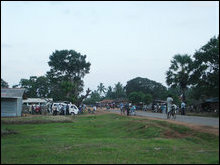 Civilians were still trapped in the site as Sri Lanka Army (SLA) launched artillery barrage on the settlement after the indiscriminate air strike. 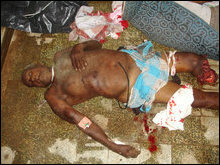 10 civilians have been killed and more than 50 wounded within 30 hours on Wednesday and Thursday in Murasumoaddai. Mortuary at Tharmapuram hospital on January 01, 2009. 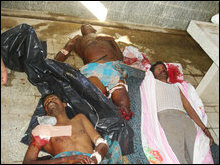 5 civilians killed in Murasumoaddai. 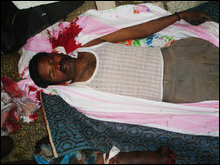 Three civilians, Rasiah Vasuky, a lady teacher, her 67-year-old father Saravanamuthu Rasiah, and a 26-year-old male S. Saravananthan, were killed on the spot. Two civilians, Muththulingam Selvarajah, 28, and Thuraisamy Prasanthan, 23, succumbed to their wounds at the hospital in Tharmapuram. 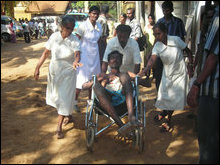 Civilians were blocked from fleeing from the carnage as SLA launched artillery barrage on the settlements. Many wounded were trapped at the locality unable to be transported to hospital in Tharmapuram. The indiscriminate bombardments has taken place between 3rd and 4th Mile Post on Paranthan Mullaiththeevu Road. 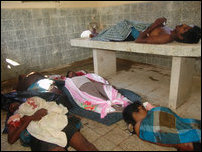 Sri Lanka has stepped up attacks on civilians in Vanni as global attention was focused on Gaza strip. The motive behind the intensified attacks by the SLAF and SLA on civilian targets aims to instill fear and panic in the hearts of civilians in Vanni. 31.12.08 5 civilians killed, 16 wounded in air strikes, hos..